The Native American Flute (NAF) heritage, legacy, and its evolution into a multitude of aspects of contemporary society, are quickly becoming emergent themes in elements of 21st Century Education in some schools across the country. The scope of possibilities for integration into many aspects of school programming is both vast and exciting. The Native American Flute can potentially enrich educational programs through a variety of skills development, values studies, social studies (geography, history, cultural teachings, languages), language arts (reading, research, storytelling, writing), health and healing, safe and caring schools, technology (music videos, slide shows and sound tracks, recording, YouTube), global citizenship (ie. community involvement, nature study, stewardship, and ecopsychology) , creativity, music and other aspects of fine arts (art, drama, puppetry, historical re-enactments), and expression/development of self-worth, creativity, and identity. Immediate enablement of creative musical expression is only one facet of the flutes. At a most elemental music study level or as a means of expanding into an intensive , potentially cross-curricular study, the Native American Flute offers a positive and empowering opportunity for students to interact with a joyful, musical experience on both an individual level and in a group sense. Connection with nature and a pulse on the "heartbeat" of other cultures are closely associated with the Native American Flutes. The flutes also provide the opportunity, depending upon the focus of the school, youth, art, or community group, for individuals to take their music beyond the instruction setting and out to their homes, into their communities, churches, seniors' homes, hospitals, concerts, or fundraisers, thus contributing to the overall well-being of self and community. There are many philosophies for the teachings and infusion of the Native American Flutes within the classroom. 1) Some individuals prefer these flutes to remain a cultural tradition, following traditional songs and protocol…and educate accordingly with cultural origins, traditional teachings, songs, stories, and spirituality. 2) Other educators or group leaders (at times including origins and teachings where possible) may incorporate a flute building workshop with their community or school’s art program and make flutes which they then incorporate into the music program much as recorders and hand bells may be incorporated; with a focus of building upon melody, rhythm, timing and other musical applications. The flutes may be easily incorporated within school assemblies and performances as well. 3) The Native American Flute offers opportunities for individuals to explore many facets of 21st Century Learning through integration of the tradtional elements of the instruments into the academic curriculum, visual arts, technology, world music ensembles, provision for safe and caring schools through values learning, counselling and inclusion, and healing through creative expression and development of feelings of self worth. Although a valuable instrument for musical instruction, the implementation of the NAF within other aspects of school programming holds great potential and lessons and related activities are currently in the developmental stages. Within the NANA membership, several of our educators and cultural advisors are presently working upon curriculum and related classroom activities for various ages of students across Canada and the USA. Rich Dubé and Kevin Locke are two individuals intensely interested in the preservation and teachings of the Native American Flute. Each is working upon curricular materials in instrument construction, performances, presentation and teachings, connecting individuals with the flutes, and provision of an actual curriculum for schools. The two men are collaborating extensively on a curriculum devoted to the traditional teachings and philosophies of the Lakota flute as well. Janina Skutle Carlstad is yet another educator who is weaving the melody and medium of the flute music into school programming. 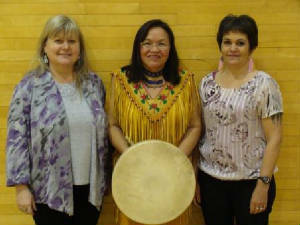 She offers traditional teachings, while concurrently developing contemporary 21st Century activities evolving from classes connecting with the Native American Flute. These activities and projects expand the instruction and positive connection with the NAF in the classroom into other aspects of the school program and across several grade levels as listed in part 3 above. Ian Porteous and Gilbert Parent of Les Bucherons also incorporate the construction and playing of the Native American Flute within their Canadian culture and history workshops in schools across Canada. Flute makers create opportunities for students to make their own flutes or purchase starter sets. Those flute makers are listed here and also provide introductory materials, music, and even accessories for bringing the flutes into the schools and other groups. If your group has been involved in school instruction, school flute circles, teachings, or providing flutes and starter kits for schools, we would be happy to hear from you! Celebrations, challenges, additional information, etc. would all be of assistance to people seeking guidance in this area. Please contact Janina to have your comments or insights included on our NANA website for the benefit of others.